In the previous chapter, we have learnt about the memory organization of the pointer variable. In this chapter we are learning to compute or find the size of pointer variable. Pointer is the variable that stores the address of another variable. 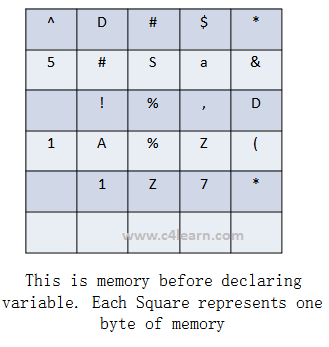 Consider the following memory map before declaring the variable.In the memory comprise of blocks of 1 byte. Whenever we declare any variable then random block of memory is chosen and value will be stored at that memory location. Similarly whenever we declare any pointer variable then random block of memory will be used as pointer variable which can hold the address of another variable. Pointer stores the address of the Variable. Address of variable is considered as integer value. For Borland C/C++ Compiler, for storing integer value 2 bytes are required. Thus Pointer variable requires 2 bytes of memory.